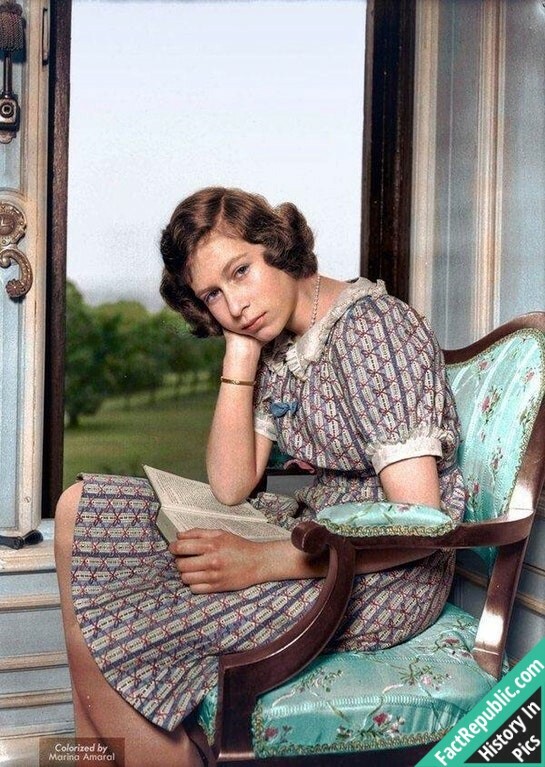 Colorized photo of Princess Elizabeth reading at Windsor Castle 1940, nearly a year into the World War 2. 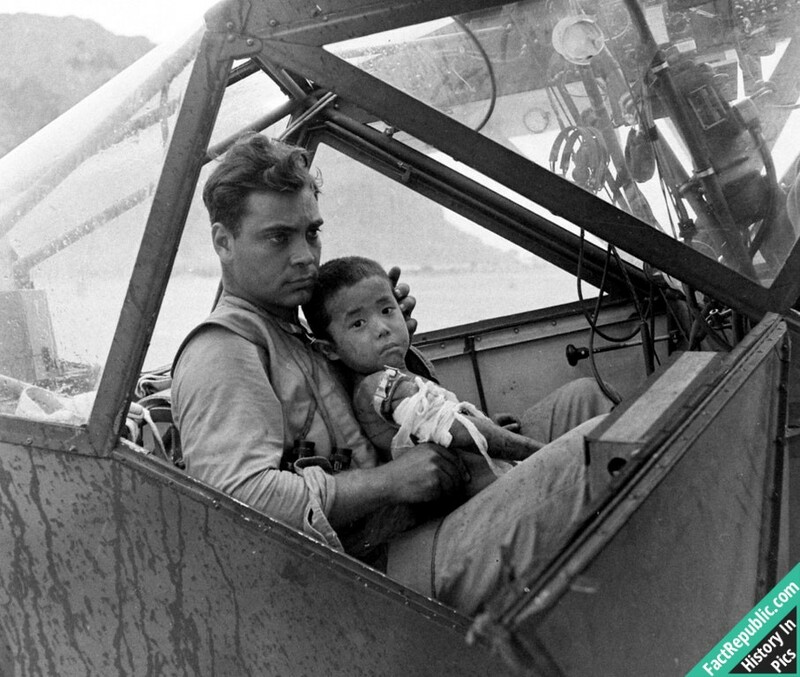 An American soldier cradles a wounded Japanese boy and shelters him from the rain in the cockpit of an airplane during the Battle of Saipan, while waiting to transport the youngster to a field hospital. July 1944. Japan considered Saipan as part of the last line of defenses for the Japanese homeland and thus had strongly committed to defending it. The Imperial Japanese Army and Imperial Japanese Navy garrisoned Saipan heavily from the late 1930s, building numerous coastal artillery batteries, shore defenses, underground fortifications and an airstrip. In mid-1944, nearly 30,000 troops were based on the island. The Battle of Saipan from 15 June to 9 July 1944 was one of the major campaigns of World War II. The United States Marines and United States Army landed on the beaches of the southwestern side of the island and spent more than three weeks in heavy fighting to secure the island from the Japanese. The battle cost the Americans 3,426 killed and 10,364 wounded, whereas of the estimated 30,000 Japanese defenders, only 921 were taken, prisoner. Weapons and the tactics of close quarter fighting also resulted in high civilian casualties. Some 20,000 Japanese civilians perished during the battle, including over 1,000 who committed suicide by jumping from “Suicide Cliff” and “Banzai Cliff” rather than be taken, prisoner. Seabees of the U.S. Navy also landed to participate in construction projects. With the capture of Saipan, the American military was now only 1,300 miles away from the Japanese home islands, which placed most Japanese cities within striking distance of United States’ B-29 Superfortress bombers. The loss of Saipan was a heavy blow to both the military and civilian administration of Japanese Prime Minister Hideki Tōjō, who was forced to resign. Belgian coal miners crammed into a coal mine elevator, coming up after a day of work, circa 1900. These people actually didn’t wash themselves after such a workday. Maybe just a quick face wash and hand wash. Bath time was usually measured by the week so generally most people didn’t do much washing at all. Laundry was also done by the week and it was a brutal affair for the women doing it by hand. The washing machine as an invention saved days of a house wife’s time. In fact, women of that generation consider washing machine as the greatest invention in their lifetime. This then opened up a whole new labor market because women could spend less time doing household chores. The Addams Family in 1964. John Astin, the actor who played Gomez Addams, is the adopted father of Sean Astin, whose mother is Patty Duke. Jackie Coogan, the actor who played Uncle Fester, costarred with Charlie Chaplin in the Kid (1921). Coogan’s mother spent all his money from the movies he starred in as a child, which was the catalyst for the first laws protecting the money made by child actors. 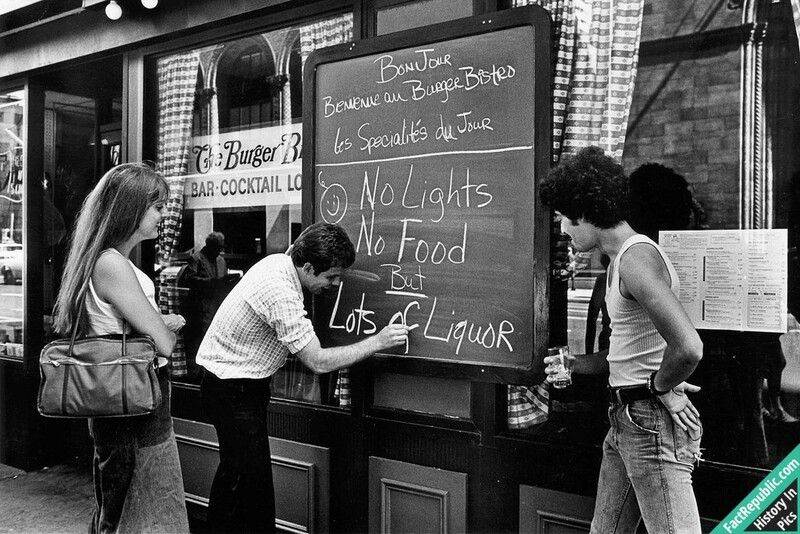 “Lots of Liquor” – New York City Blackout, July 13, 1977. The blackout occurred when the city was facing a severe financial crisis and its residents were fretting over the Son of Sam murders. The nation as a whole was suffering from a protracted economic downturn. Some pointed to the financial crisis as a root cause of the disorder, others noted the hot July weather, as the Northeast at the time was in the middle of a brutal heat wave. Still, others pointed out that the 1977 blackout came after businesses had closed and their owners went home. However, the 1977 looters continued their damage into the daylight hours, with police on alert. Looting and vandalism were widespread, hitting 31 neighborhoods, including most poor neighborhoods in the city. Possibly the hardest hit were Crown Heights, where 75 stores on a five-block stretch were looted, and Bushwick, where arson was rampant with some 25 fires still burning the next morning. At one point two blocks of Broadway, which separates Bushwick from Bedford-Stuyvesant in Brooklyn, were on fire. Thirty-five blocks of Broadway were destroyed: 134 stores looted, 45 of them set ablaze. Thieves stole 50 new Pontiacs from a Bronx car dealership. In Brooklyn, youths were seen backing up cars to targeted stores, tying ropes around the stores’ grates, and using their cars to pull the grates away before looting the store. While 550 police officers were injured in the mayhem, 4,500 looters were arrested. In all, 1,616 stores were damaged in looting and rioting. A total of 1,037 fires were responded to, including 14 multiple-alarm fires. In the largest mass arrest in city history, 3,776 people were arrested. Many had to be stuffed into overcrowded cells, precinct basements, and other makeshift holding pens. A congressional study estimated that the cost of damages amounted to a little over $300 million.